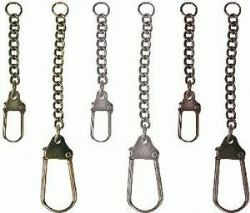 The package contains 12 swivel clasps, 4 of each antique finish: copper, nickel, and brass. The clasps come in two sizes - 2.78 inches long and 3.75 inches long. Use for altered art and adding decorative detail to cards, scrapbooking pages and other projects.